Like other dogs, African wild dogs are highly social. They usually live in packs of six to twenty individuals with a dominant breeding pair. They communicate through a variety of vocalizations, movements and touch. The scientific name for the African Wild dog means “painted wolf”. 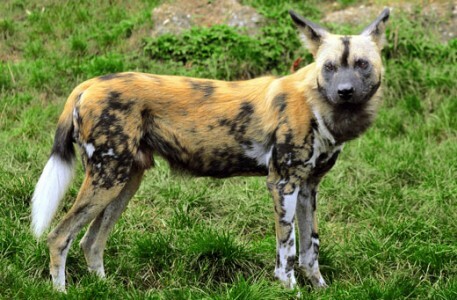 No two wild dogs have the same markings, which makes them easily identifiable as individuals. African wild dogs have huge home ranges and are constant wanderers. In the Serengeti the estimated size of each pack’s territory is 1,500 km2. An area the size of Greater London, which is home to 7.5 million people, could therefore only support one or two African wild dog packs. Unlike many other species, once they reach maturity it is the males that stay within their natal pack while females migrate and join new packs. Pups that are old enough to eat solid food are given priority at a kill, even over the dominant pair. Although once considered a “pest”, the African wild dog has become a symbol of pride in Zimbabwe. Thanks to efforts by local communities and NGO’s, the wild population in Zimbabwe has almost doubled in recent years. African wild dogs are intelligent and cooperative hunters. Some of the dogs run close to the prey while the others fall behind. They then take over when the front members tire. The dogs have a playful ceremony that bonds them for a common purpose and initiates each hunt. They start circulating among the other pack members, vocalising and touching until they get excited and are ready to hunt. When feeding, they lack aggression towards each other and share the kill; even with members who may not have been involved in the actual hunt. The entire African wild dog pack shares responsibility for protecting the cubs, with both males and females babysitting the young.